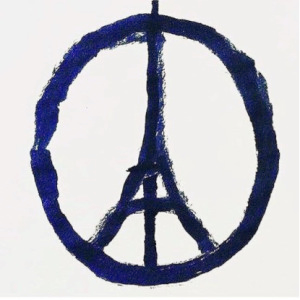 Prayers and Peace for Paris… | amen and ehmen! As the world mourns with and prays for the people of Paris, I, too, lift my eyes to the Heavens. Lord, I ask You to make Your Presence known to all the hurting and fearful. Clothe all of us, especially those directly impacted by the attacks of the past few days, in the peace that only You can provide; in that special peace which surpasses all understanding. We love you, Lord, and praise you, even in the midst of this mighty storm. Amen and Ehmen. Note: This morning as I prayed this prayer, the following words nestled into my spirit. I gave them a home on paper and I found comfort in them. I hope that you do as well. As darkness descends on a fallen and trembling world, the Heavens roar as our Almighty God summons all of His angels. War has been waged. To that no one can argue. But, those who believe know that it is a war that is already won. The enemy’s fate has been sealed. Stand in faith, people of God. Do not let the enemy shake you. Do not let the darkness consume you; for it is indeed darkest before the dawn and, no matter how bad it gets; nor how painful it is, know that even this horrible suffering is nothing compared to the Glory that is to come.